Perhaps the single most remarkable coup achieved by a film cameraman in the 1890s was when W.K-L. Dickson, after months of trying, managed not only to film Pope Leo XIII but to get him to bless the camera as he did so. According to Dickson, the American Biograph company was approached by a group of Roman Catholic prelates, among them Monsignor Martinelli and Cardinal Gibbons, who had been impressed by the Biograph and especially by the popular rection to the scenes of President William McKinley, and thought that it would be an excellent film if the Catholics of America could see similar picures of the Pontiff and 'receive the Pope's benediction'. Armed with letters of recommendation and the encouragement of the Biograph company, which had gained much prestige for its exclusive pictures of the famous, Dickson (by now working for Biograph's British division) went to Italy early in 1898, partnered with cameraman Emile Lauste (son of Eugène Lauste). Four months of negotiation followed before Dickson got permission to film a man who had not even posed for a photographer for eight years. In April/May 1898 he took twelve scenes in five sittings of the Pope in the Vatican grounds, in his carriage, walking, being carried in a sedan chair, and seated with attendant clerics. 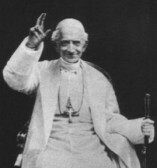 Crucially Dickson and Lauste secured film of the Pope raising his hand in blessing (both from his carriage and while seated), meant for the Biograph audience but giving every impression of being bestowed on the camera itself. Pope Leo gives no impression of being a man shy of the camera, performing for it with evident enthusiasm in what is a charming series of films that became justly famous.